Bali - Worth The Hype? 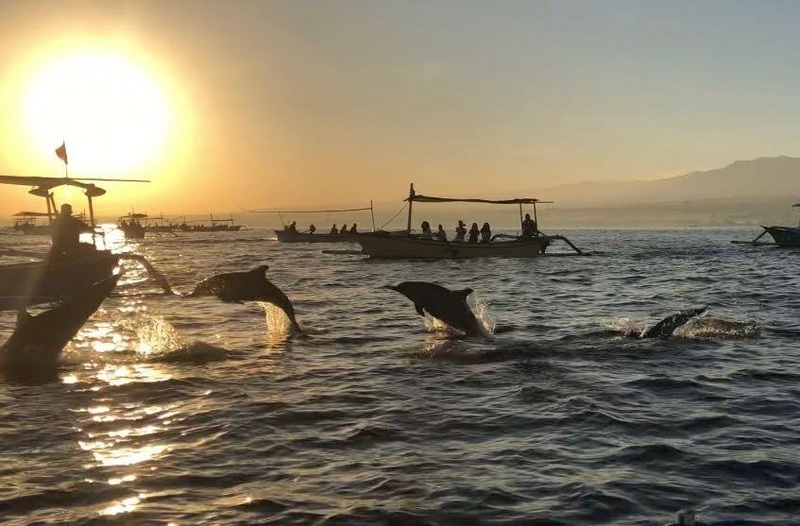 When I finally got a start date for work, I decided to book two weeks in Bali, given that I've always wanted to go and it's only a 6-hour flight from Melbourne. 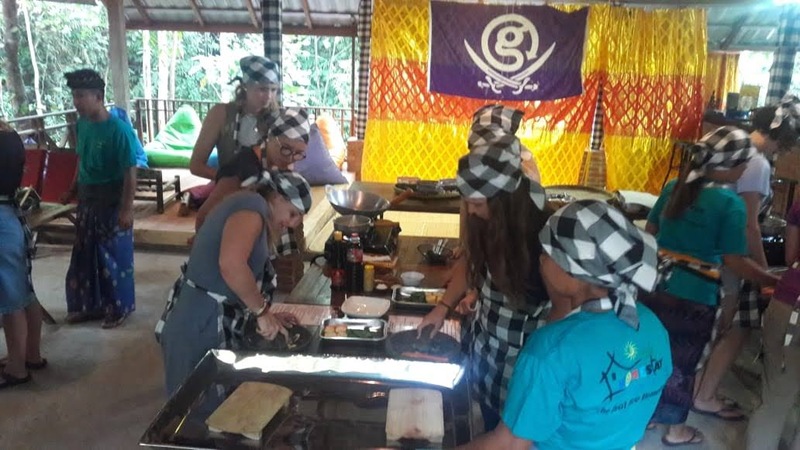 I was most excited about visiting Gili-T, having heard that it's the party capital and seen lots of fantastic photos of the area. 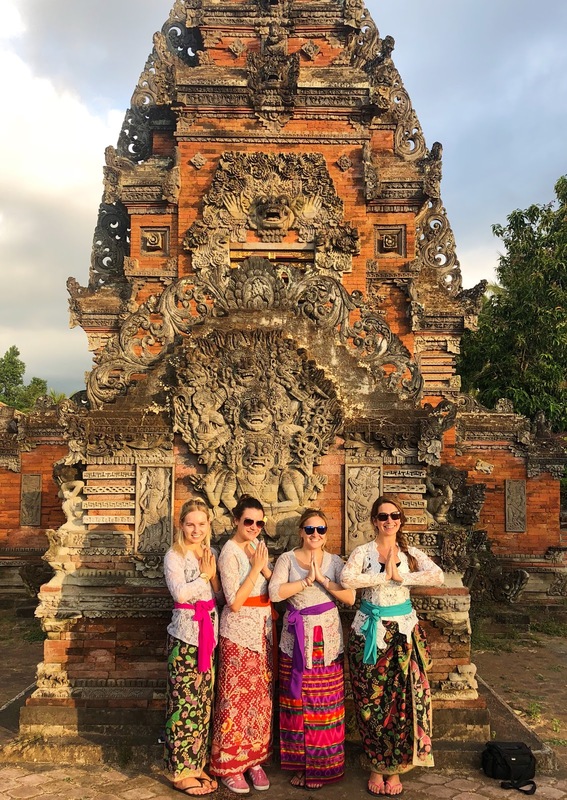 A few days before I was due to fly out, the earthquake happened, and so understandably I was informed by the tour company that we would no longer be visiting the island of Lombok and the tour would be altered. I decided to still go ahead, mainly as I was desperate for more sun! I decided to have two nights to myself in Kuta before joining the tour group, as I was very keen to chill by the pool, speed through a few books, and just enjoy time to myself. I feel like since arriving in Australia it has been a pretty overwhelming experience, and so it was nice to just switch off for a while. 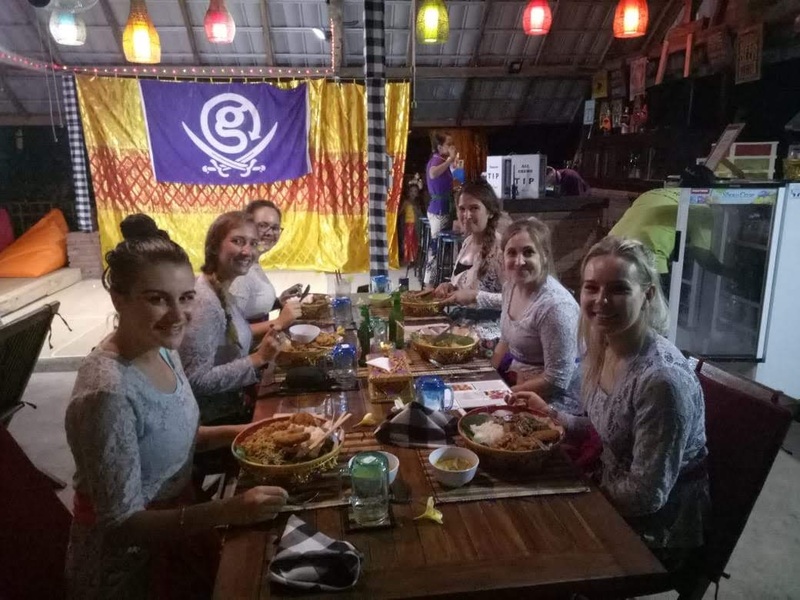 The fantastic thing about going away with a tour company (I have used G Adventures four times now and have nothing but the highest praise for them), is that you get to do things that are 'off the beaten track', essentially because you have a guide who is from the area, or knows the area extremely well. Our guide, Gede, was from Bali, and has even set up his own home-stay. He helps to support the local community by providing funding for a local school, and provides jobs for many of his family members and friends at his home-stay. 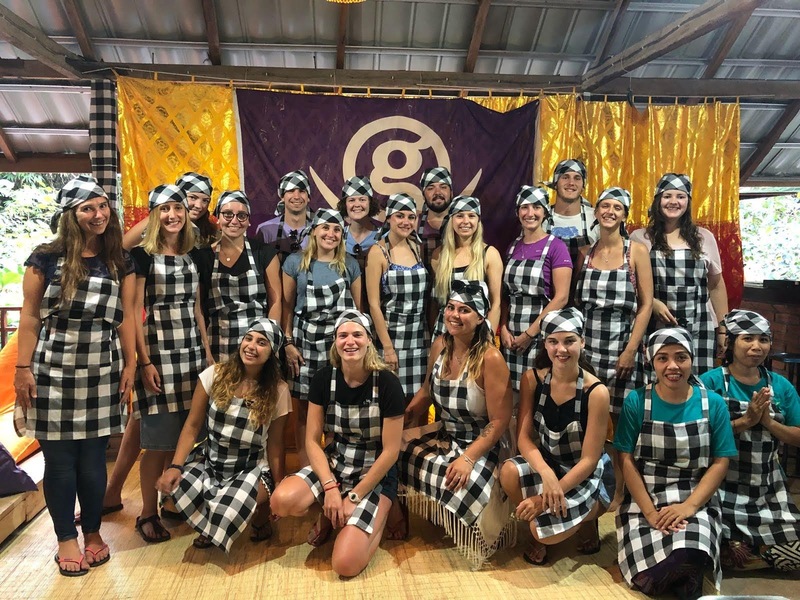 Whilst at the home-stay for two nights, we got to take part in an Indonesian cooking lesson, dress up in traditional Balinese outfits, and watch a traditional Balinese dancing show. The staff there were incredible; given that there were 18 of us in our group, they asked each of us our names once and all of the waiting staff remembered exactly who we were. They were so friendly and kind and really made such a difference to our stay. I think the highlight of the entire trip for me has to be going on our sunrise dolphin-spotting tour. We had a 4am start which was particularly painful, but was worth it when by 06:00 we were out on the boat absolutely surrounded by dolphins swimming right up next to our boat. Amongst the backdrop of the sun rising, it was a pretty magical morning. I hadn't honestly expected to get to see anything, despite being guaranteed by the people running the tour that we'd see at least a few dolphins. After we had seen the sunrise and dolphins and had some breakfast on the beach, we drove up to the Holy Hot Springs, which was a nice little detour on the way to the waterfall walk at Sekumpul. 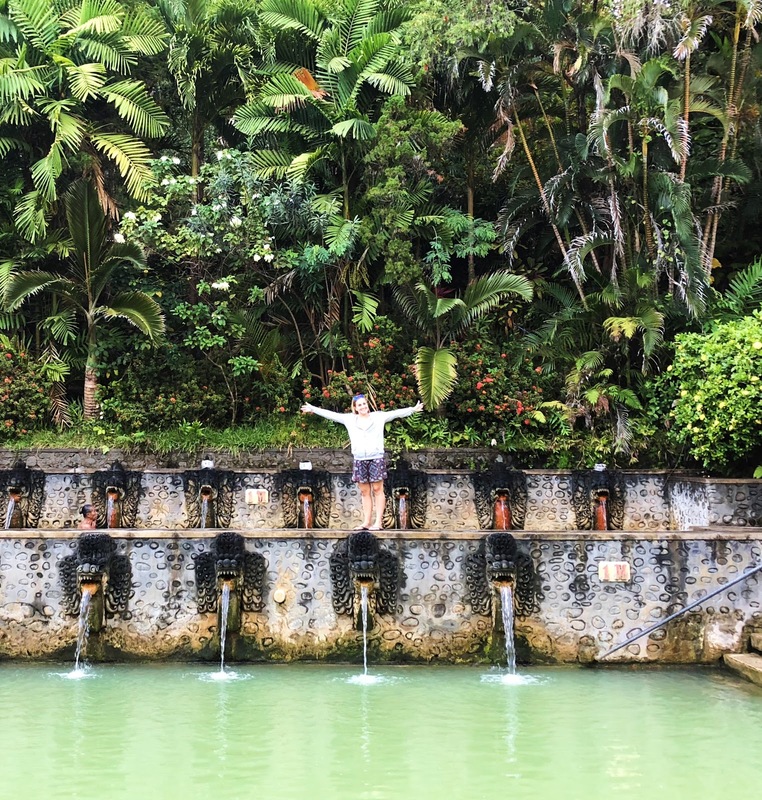 Group tours are great but sometimes you can feel as though your itinerary is so packed that you have minimal downtime, so this was a nice stop to relax! Another great thing about organised tours such as these is that for the most part you don't have to worry about the little added extras and paying for all the admission fees, as the tour guide will sort it all out in bulk and you just turn up. The walk down to the foot of the waterfall was very long and very steep, with a lot of steps. Fine on the way down, but not so fine when you consider how hard the walk back up is going to be! A couple of us decided to swim under the waterfall once we got to the bottom, whilst the others dipped a toe in and decided it was far too cold to even attempt! It certainly was refreshing, that's for sure! I love walking but the heat was so stifling that it was definitely a struggle. Another day, another waterfall. I really enjoy walking / hiking and exploring beauty spots such as this, so I was glad that the tour factored in so much of the same. As our tour was part of another tour that had travelled other parts of Indonesia, the people in our group that had already been in Indonesia for a while felt that they had already had an overload of temples and waterfalls, so they skipped a lot of the things we decided to do, so it was good that we had the option to split into smaller groups based on what we wanted to do. 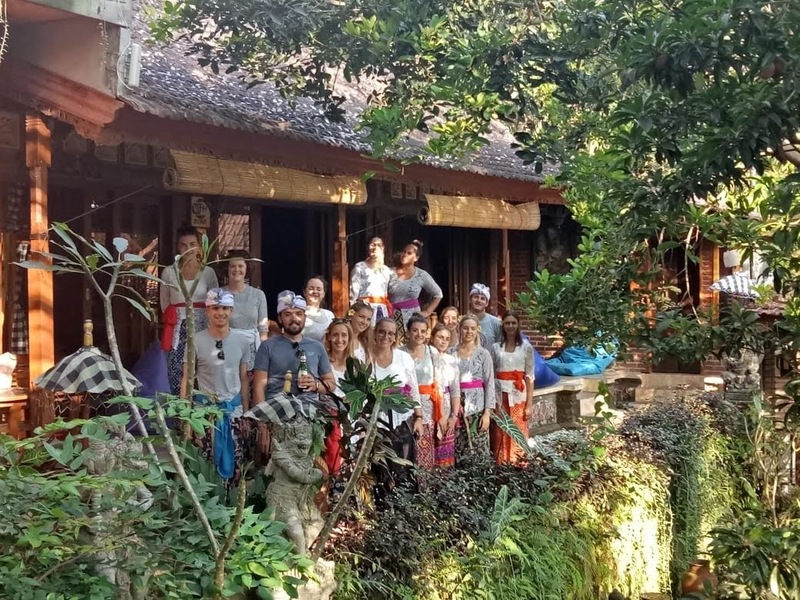 A common misconception of guided tours is that you are tied in to a strict itinerary, but every day's activities were completely optional, and could be changed if we weren't happy with something or fancied a change. There was plenty of flexibility and our guide was fantastic at trying to cater for everyone. We visited Ulun Danu Beratan Temple, which is a beautiful temple on the shores of Lake Bratan, in the mountains. We were lucky to have good weather, as the group that had gone previous to as had rain all day long and this somewhat distracted from the views. Our guide was full of interesting information about Indonesian culture, and most of us were really shocked when he explained to us that everyone in Indonesia has to state a religion on their government ID card, out of the choice of six. Fortunately our trip featured plenty of downtime when we fancied it, and for me this involved a couple of different massages on separate occasions, and chilling by the various different pools with a (very cheap) alcoholic bevvy. 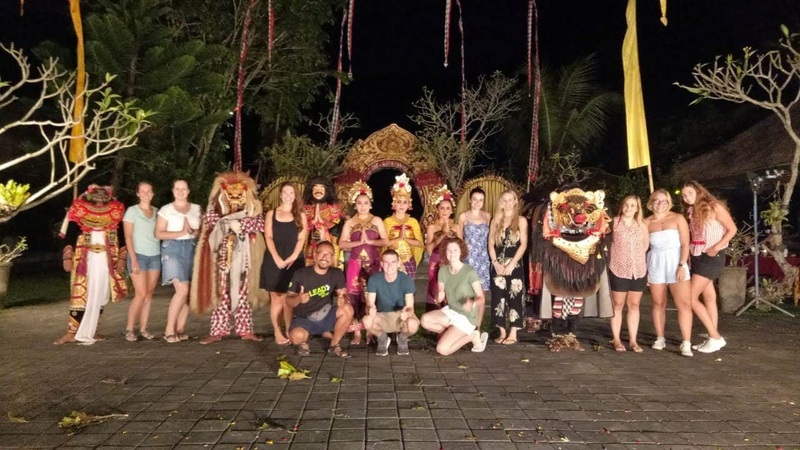 A few days before the end of our tour, our guide Gede took us to a traditional Balinese restaurant, where there was a traditional dance and drama performance based on a traditional story of the Gods. I must say it was a very bizarre performance, with accompanying repetitive music that sounded like something out of a horror film, but it was an interesting experience nonetheless. Unfortunately we waited at least two hours for our meals, which putted a massive dampener on the evening. We all ate something completely different, some eating chicken, others eating duck, others eating vegetarian. It was the morning after this dinner that a large majority of our group became unwell. We couldn't identify a specific cause because everyone had eaten something different, and around eight other people from our tour went to a different restaurant that night and a few of them also became unwell. 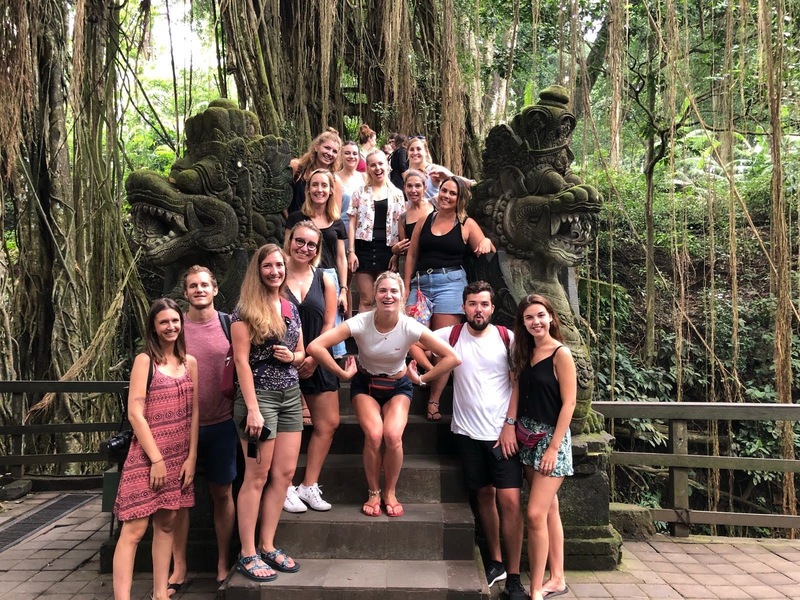 I really enjoyed the Ubud Monkey Forest, as the monkeys were wandering around all over the place, and it was surprising how close we could get to them. There were quite a few rules before we got in, including not to make eye contact with the monkeys! I realised the seriousness of this when I was taking a picture of Amy next to a monkey sat on a railing, and as she turned to look at the monkey it took a direct swipe at her! Vicious little creatures they can be. They were absolutely fascinating though, and it really amused us when we saw the daddy monkey standing on the baby's tail to stop him wandering off. So was Bali worth the hype? I will say I'm glad I only had to commit to a fairly cheap flight and six hours of travel time, as if I had travelled all the way from the UK I would have been very disappointed. Kuta, where we first stayed, was very much a Benidorm away from home, and was full of stag dos and lads' holidays. There were a lot of people who travel to the same destination several times a year and get stuck into their same old holiday routine. 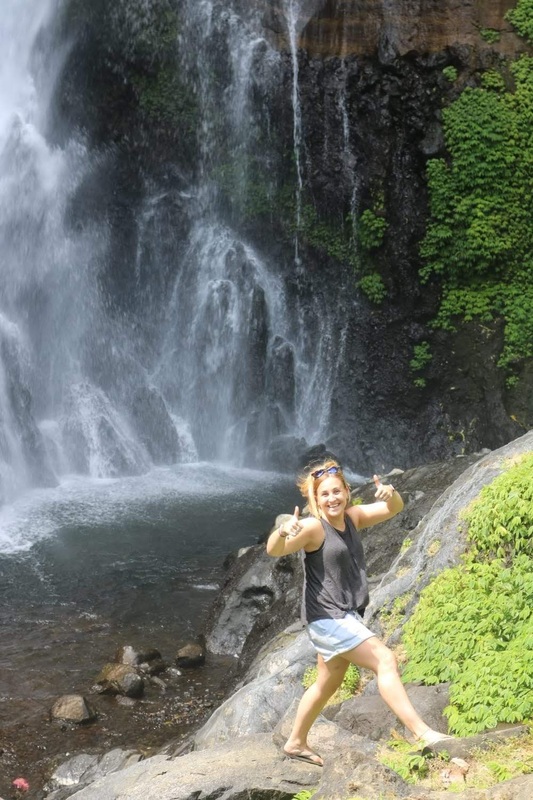 Granted there are some really stunning places in Bali to explore, and I loved the wildlife and beauty spots, and the weather is a definite pro, but I can't say that it was anything out of the ordinary for me. I thoroughly enjoyed my trip, but I won't be making a return as there are so many other places in the world that appeal much more.